So, a few days ago I made a statement on the Facebook page about how much I hate cranberry sauce. And everybody wrote in with all these recipes and ideas about their favorite cranberry sauces. And the whole time I was rolling my eyes thinking… y’all can tell me all you want, but I. don’t. frickin. like. cranberry. sauce. Or anything that resembles it. And I dang sure don’t want any of it near my turkey come Thanksgiving. BUT THEN… I cooked a big Thanksgiving dinner this weekend so I could put my favorite turkey recipe on the blog so you'll have them in time for the big day. I invited friends and family over to help me eat it and guess what my friend, Dawn brought with her? Cranberry sauce. I love her great big giant gonads. So, to be polite, I put about 1/8 of a teaspoon on my plate. And then everyone at the table started raving about it. So I tasted it. EAU MAH GAH, y’all. It was SO GOOD! I think what won me over was the texture. I’m not a big gelatin fan which might have something to do with my aversion to cranberry sauce since most that I had as a child came out of a can. Also? I was the only college student in the world that couldn't stand jell-o shots. The texture in this is what did it for me. The finely chopped celery and walnuts offer a little bite alongside the fibrous pineapple and cranberries and balance the sweetness. The gelatin really just holds it all together – it’s not rubbery. So, here’s Dawn's cranberry stuff. I will totally be making this for Thanksgiving this year which will be the first time I've made cranberry sauce. EVER. I can't wait! I know this isn't the best picture but I didn't know I was going to love it before we dove in to it. These are the leftovers. And Angel Baby. Who wanted to eat it for breakfast the next morning. Combine gelatin and boiling water in a medium bowl and stir to dissolve gelatin. Add sugar and lemon juice and stir until sugar is dissolved. Add pineapple and juice. Using a food processor or hand-held food chopper, chop frozen cranberries until uniform in size with the chopped walnuts and celery (cranberries must be frozen to chop properly). 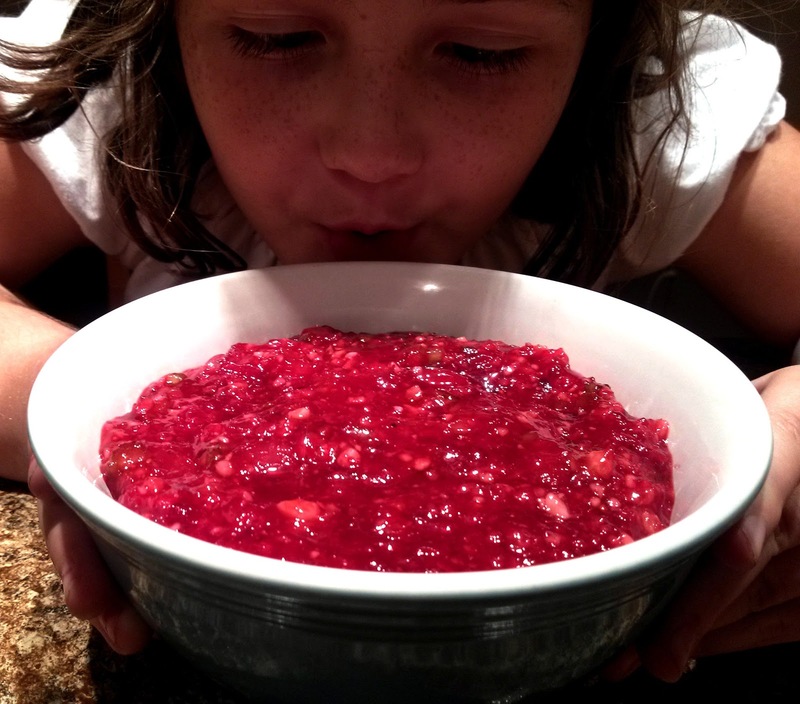 Process or chop enough cranberries to measure two cups of chopped cranberries. Add two cups chopped cranberries, celery and walnuts to mixture and stir to combine. Pour into a gelatin mold or glass serving dish. Cover and refrigerate several hours or until set. I have made this salad at Christmas and it's so delicious. Mandy, add some diced peeled apple to this cranberry salad recipe for even greater texture and flavor! Also, for another great textured cranberry salad, I have a Frozen one that is divine! Chocked full of crunch and flavor. If you'd like the recipe, email me at lyn.lewellen@yahoo.com and I will send it to you. Happy Thanksgiving! This is very close to the Cranberry Salad my mom makes (or I do now). I've never put in celery or walnuts in ours. My husband did not like cranberries either until he ate this salad. I also make enough for my sister's family at Thanksgiving and Christmas. Does it have to be raspberry gelatin? Wouldn't cranberry gelatin be even better? I ask because I HATE raspberries! If you like citrus, try adding fresh orange supremes instead of the celery. To die for!